We are an independent company established in Cricklewood in 1910, committed to combining our experience with personal service and professional values in all property related matters. We offer property services in residential sales,commercial agency and portfolio property management. For residential sales clients, we aim to provide a professional service from market appraisal through to the day of your move. Prospective purchasers will discover we market a diverse selection of properties from modern studio flats to large, period style detached houses predominantly in NW2, NW10 and NW6. These areas offer access to a variety of transport services including the First Capital Connect station at Cricklewood, the tube stations at Willesden Green and Kilburn and a plethora of bus routes. Alternatively for those travelling by car access to the M1 and the North Circular Road is at Staples Corner. Gladstone Park provides approximately 93 acres of open recreational parkland. 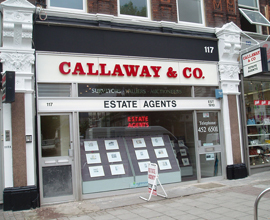 Callaway & Co. are members of the National Association for Estate Agents (NAEA) and subscribe to the Property Ombudsman scheme. Click below for further details. Callaway & Co. is part of the National Federation of Property Professionals Client Money protection Scheme. Make your move with the benefit of our experience.